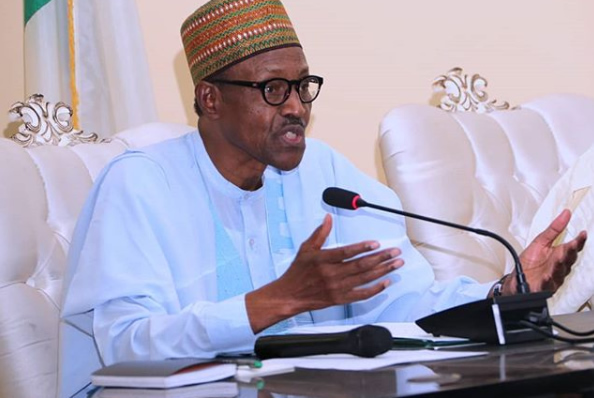 President Muhammadu Buhari on Monday in Paris, France expressed his frustration that despite his anti-corruption war, there is still massive loot stashed away by Nigerians in foreign countries. During an interactive session with the Nigerian community in Paris, Buhari said that “I am doing my best now to utilise our resources to develop the country. We are already getting results on road, rail and power. My frustration is that some people still have plenty stolen money stashed in Europe, U.S and other countries”. The President pointed out that the return of stolen assets in some safe havens would bolster the administration’s current effort of investing more in critical infrastructure that directly impact on the livelihood of Nigerians. He assured Nigerians that allocations to the educational sector would be improved as revenue increases, describing the sector as a major engine for the development of any country, noting that the about 5 per cent allo­cation to the sector was inadequate to propel the desired growth for the economy, especially given the United Nations ideal target of 26 per cent. He added that “we are currently reviewing investments in the entire infrastructure of the country like road, rail and power, including investing more in education. We will certainly need to do more in education”. He said the war against terrorism would be reinforced with new weapons and hardware for the military, while the challenge of abduction and kidnapping in some parts of the country will receive more attention with better gathering of intelligence. “We campaigned on three key issues; security, improving the economy, and fighting corruption, and we have not been controverted by anyone that we have not recorded some results,” he added. On Nigerians in diaspora participating in elections, the President said the population of citizens in various countries across the world already necessitate their inclusion to elect leaders, noting that it might not happen in the 2019 elections as INEC had been more focused on strengthening and consolidating on its achievements of conducting credible elections within the country. He said it could happen in future, however. He added that the Nigerian constitution had taken into cognisance the need for representation in the political structures in order to ensure harmony and development, urging more people to pick interest in governance and quality representation. In her remarks, Nigerian Ambassador to France, Dr. Modupe Enitan Irele, said the Nigerian community in France had demonstrated high sense of responsibility, dedication and morality, adding that the large number of professionals had been encouraged to also contribute to the country’s development. “Nigerians here are law abiding, peaceful and resourceful,” she said. Meanwhile, the president has assented to the Extradition (Amendment) Act 2018; the Federal Capital Territory Appropriation Act, 2018; and three other bills recently presented to him after passage by the National Assembly. The three other new laws are the Nigerian Centre For Disease Control And Prevention (Establishment) Act, 2018; National Environmental Standard And Regulations Enforcement Agency (Establishment) (Amendment) Act, 2018; and Nigerian Insti­tute Of Mining and Geosciences, Jos (Establishment) Act, 2018. The presidential assent was announced to State House correspondents on Monday by Buhari’s senior special assistant on National Assembly Affairs, Senator Ita Solomon Enang. He explained that the Extradition (Amendment) Act, 2018 now vests jurisdiction on extradition proceedings on the Federal High Court and no more the Magistrates Court or Magistrates. The amendment further introduces a new Section 15(2) preventing double jeopardy as protected by Section 36(9) of the Constitution which prevents a person surrendered to Nigeria in accordance with extraction treaty or obligation from being ar­rested, detained, extradited or otherwise dealt with in Nigeria or any other country within the Commonwealth or any other country having same extraditing agreement with Nigeria, if the proceedings relate to an offence for which he has been previously convicted or acquitted in the requesting country for which extradition is sought by the Nigerian authorities. The signing of the new Extradition law comes just as the Economic and Financial Crimes Commission (EFCC) made a fresh move seeking the extradition of former Petroleum Minister, Diezani Allison-Madueke, from the United Kingdom, over allegations of corruption. On the new FCT Appropriation Act, Enang disclosed that the Act allows aggregate capital and recurrent Expenditure of N371.532 billion up to the financial year ending December 31, 2018. The Nigerian Centre For Disease Control And Prevention (Establishment) Act, 2018 is aimed at promoting, coordinating and facilitating the prevention, detection and Control of Communicable diseases and other public health emergencies in Nigeria. The National Environmental Standard and Regulations Enforcement Agency (Establishment) (Amendment) Act, 2018 is an amendment to the 2007 Act and more suc­cinctly defines matters of appointment to the Council, empowers the Agency or appropriate person to cause immediate abatement of im­minent environmental pollution while appropriate warrant or court order is sought to ensure public safety, among others. The Nigerian Institute Of Mining and Geosciences, Jos (Establishment) Act, 2018 establishes the Institute to provide courses of instruction, training and research in geosciences and mining and produce technicians and such skilled personnel normally required for the mining and related industries. It further provides for both the public and private sectors alike, laboratory services for rock and mineral identification, sampling and mineral beneficiation, mineral and metal­lurgical analysis; Conduct research in mining, quarrying and related industries; Provide skilled training for the artisanal and small scale mining operators; among others.